At one o’clock in the morning, Sunday, September 2, 1666, a disastrous event began and didn’t end until Wednesday, September 5th. It is known as The Great Fire of London and would change the city forever. The fire began at Thomas Farynor’s (baker to King Charles II) bakeshop on Pudding Lane. Thomas and his family were woken by a servant and escaped, however one of their maids didn’t fare so well, perishing in the blaze. The streets were narrow and rutted, and the buildings piled one on top of another. It was a medieval city that had just continued to grow without any thought for planning or overcrowding. A lot of the buildings had jetties. This means they start out small but with each floor got bigger and bigger, the top floor well surpassing the first. Not unlike the shape of an ice cream cone, or upside down pyramid. The fire leapt from house to yard catching hay, feed, and anything else in its path on fire. Soon it reached London Bridge and consumed half of it before coming to a halt at the gap where a fire 33 years prior had occurred. Widespread panic began when the fire reached the Roman Walls encasing the city. Prior to that, people didn’t feel the need to escape, just went from safe house to safe house. Now it was apparent that they weren’t safe. Thousands flocked to the gates, pushing and shoving each other to get out of the city. 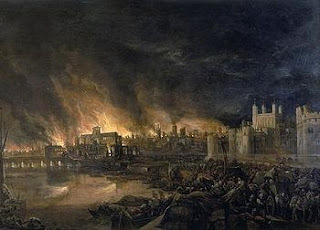 The fire destroyed the entire city within the Roman Walls, but did not reach the aristocratic domains in Westminster or the residence of Charles II, Whitehall Palace. Fire brigades worked tirelessly to put out the fires, but little can be done with buckets of water when a raging inferno is consuming everything in its path with assistance from blustery winds. They did have “fire trucks” but some of them didn’t have wheels—only sleds—and some were stuck in the gridlock of panic-stricken people. Others that reached the fire, had no where to get water from. One to the biggest helps in past fires, the people had discovered were to create breaks, for example demolishing a house or building to deprive the fire of fuel to keep moving. 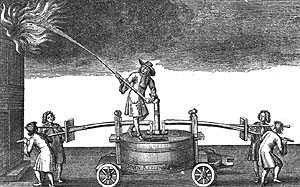 This was suggested to stop the fire, and had it been done earlier the damage would not have been so severe, but at the time, the Lord Mayer of London, Bludworth was hesitant to place the order. Seeing as how nothing was being done, Charles II ordered the demolitions, but it was too late, the fire too big a monster to squelch. When the Trained Bands of London destroyed the buildings with gunpowder explosions, they didn’t have enough time to clear the rubble away before the fire was on them, and thus the fire raged on, perhaps even worse than before with the added supply of gunpowder. For another three days the fire raged, until coming to a stop at Temple Church. But the winds picked up again urging it forward toward Westminster. The Duke of York, ordered the Paper House demolished as a break, and lucky he did so, because the fire died there. 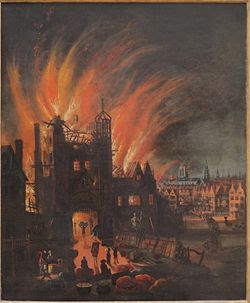 The fire destroyed around 13,500 houses, 89 churches, 52 Guild Halls, the Royal Exchange, the Custom House, St. Paul’s Cathedral, Bridewell Palace, city prisons, General Letter Office, and three of the Western city gates. It is estimated in about $1 billion in damage in today’s monetary standards. Surprisingly only about 8-16 lives were lost. And in fact there was some good to come out of it, despite the fact it ruined 85% of the city, bankrupt and displaced thousands, and that was that it killed off thousands of rats that carried the plague virus which had been surreptitiously killing people for years. Another good thing to come out of, the king commissioned the city to be rebuilt, this time with wider streets and brick buildings. 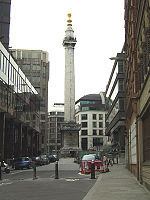 By 1671, the majority of buildings were complete, and in 1675 the king commissioned Sir Christopher Wren to rebuild St. Paul’s Cathedral as well as a monument, which still stands today in the place where Mr. Farynor’s bakery used to stand, a street now called Monument Street. Excellent post. I'd like to see more books use the Great Fire of London as a backdrop besides Forever Amber. 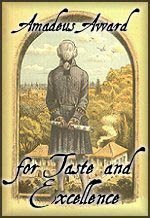 Although I think there was a Harlequin Historical trilogy that also used it. A great, detailed telling of the Great Fire. I found it ironic, too, that the Fire was contained only by the ancient Roman walls around London, given that the Iceni Queen, Boudica had razed London too, burning it to the ground during the Roman occupation. Guess those Londoners can't catch a break? But it is further irony that St. Paul's survived the Bombing of London during the Blitz of WWII. Great blog! Thanks for satisfying my Tuesday History requirement! A day without history is like a day without sunshine for me! Amazing that so few lives were lost. Such devistation. Interesting post! 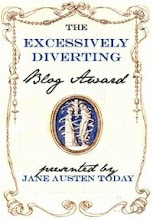 Great blog so full of information. With the fires in the southern part of my state right now I can appreciate how lost they must have been tring to get out those fires. 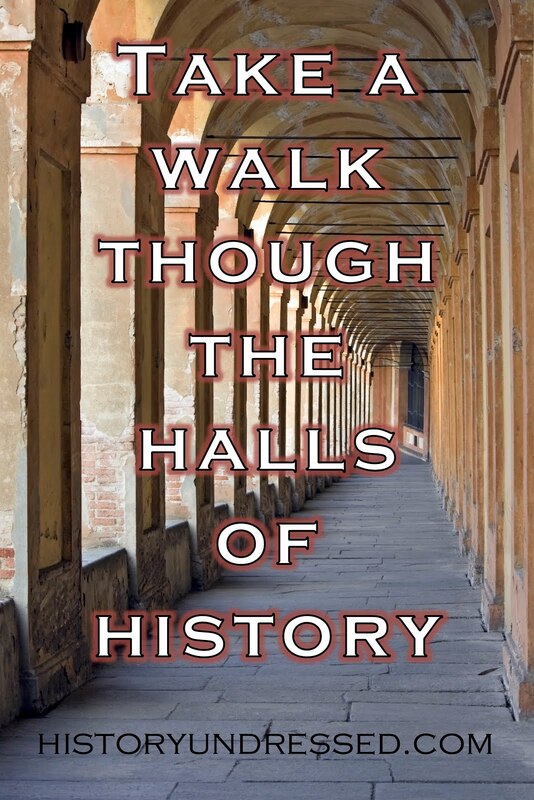 What amazes me about history is how little we learn. Every great city has had its fire, including the one I now live in, Seattle. If you see the old parts of Seattle, the buildings are packed together on narrow streets and separated by even smaller alleys. Needless to say, when the glue pot went over in 1898, the city went up like a torch. More recently, when housing prices were really high, my sister and I drove through an area of new townhouses. The houses were jammed together---I don't think you could get a lawn mower between them---and the streets were worse. A few weeks later, we saw an article in the newspaper. The fire department was complaining they could not get their trucks into these developments, especially when people parked on the streets. We never learn. Thank you Elizabeth! I would too. It would add a lot of intensity for sure! Thank you Lise! I totally agree, how odd huh? I think it is very ironic, perhaps St. Paul had had enough. And I'm with you on the daily history binge, I can't get enough. Thank you Willow! I thought the same thing! Thank you for you comment Paisley! Those fires are crazy out in CA, amazing how quickly it can spread. I think I remember reading somewhere that Charles was brave enough to be in the middle of the frey trying to help the commoners put out the fire. Not sure if that is true. At least it got rid of the rats. great post! Ooh, I loved the info Eliza! I'll have to come back more often. 9 people? I read it somewhere, it says, it wasn't only nine casualties... The records say it was 9 because at that time record was kept for only rich and nobles. 9 people dead? It is a little hard to swallow. What do you say?